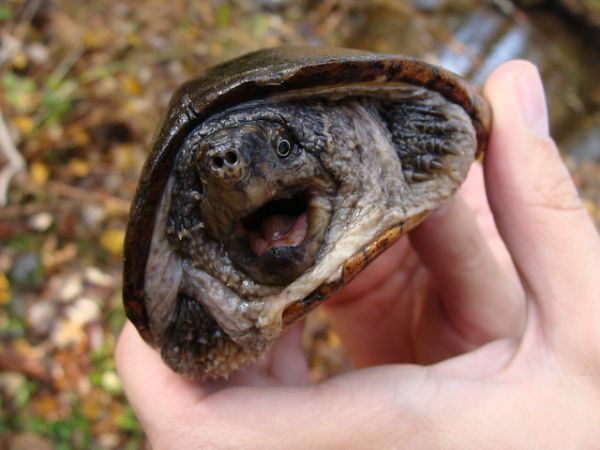 Native to the United States and Canada, the common musk turtle is akin to the Kinesternidae family. Also known as Sternotherus Odoratus or eastern musk turtles, common musk turtles can live up to 50 years or more. 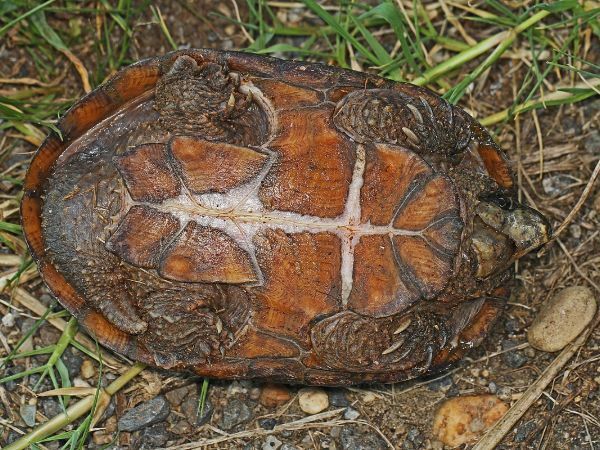 Their unique features include a deep brown face with yellow lines and a highly arched carapace that tends to become flat as they age. Male musk turtles have a longer tail than females. They have a pointed nose and a rather large head. They are not the prettiest turtles, but other characteristics make them a good pet. Found in a vast geographical array, common musk turtles are commonly found in the Eastern United States and Eastern North America. Their hatchlings are the smallest turtles in North America. While they do grow larger as they age, the females are smaller than males, usually with a shell size of 4-5 inches. It’s highly aquatic and stays mostly in waters or lakes, streams or ponds. It spends most of the time walking on swamps or marshes. It gets its name ‘musk’ or ‘stinkpot’ because it releases an orange colored musk that carries a heavily unpleasant scent that scares away its predators. This is their common defense mechanism, but they also can scratch or bite their enemies. A common musk turtle living in a wild habitat eats a variety of insects such as crayfish, snails, earthworms, and mollusks. They also feed on aquatic insects like damselfly nymphs, tadpoles, and dragonfly and fish eggs. Although musk turtles are considered carnivores by nature, however, they may also eat algae. If you have one as a pet you can feed them both dried and live mealworms, or insects like crickets. They usually dwell in shallow waters of ponds and stream. They are slow walkers and poor at swimming; therefore, choose shallow waters with low-current, marshes, soft organic bottoms, and vegetation. They are also found in wetlands with coarse wood logs and fallen trees. This is because such lands are beneficial for their basking. It buries itself under logs or mud to hibernate. The females lay 1 to 9 eggs of elliptical shape that have a hard shell. This breeding usually takes place during the spring that may last till fall, but the eggs take about 60 to 80 to hatch. Mating happens under water and the season reaches its pinnacle during the months of April and May and continues again in September to October. Eggs are laid under mud or sandy soil. When the eggs hatch after about 85 days, an incubating period follows which lasts for 9 to 12 weeks. The hatchlings are very small in size, usually about 1 inch. Common musk turtles have a unique way of fighting their predators which is to release a stench so vile that the enemy may run off. They have many predators like raccoons, skunks, large wading birds, large fishes, foxes, American Bullfrog, snapping turtles, and Northern Water Snakes. Common musk turtles are very small in size; therefore; they are very commonly kept as pets. There are certain guidelines that should be observed in order to take good care of these turtles. UVB lights should be installed and set on 12 hours on and off cycle to impersonate the natural cycle. Create a shallow watercourse. An aquarium can be a suitable place, and the size would depend upon their ages. Also, include structures in the aquarium, so they are able to climb and rest. Feed it earthworms or other insects. Although in wild habitats, they do eat snails, snails may carry diseases. They stay underwater most of the time but to ensure its health; a basking light should be provided. While handling a common musk, keep your fingers on the carapace and avoid going near the face because they will attempt to bite. They walk mostly on the bottom and fish for food and other things. Creating a natural-inspired setting can mean placing rocks and plants on the bottom of the tank. The common musk species is only considered endangered in Ontario, Canada. Raccoons, pollution, poaching and fishing lines, and traps are dangerous to turtles and eggs. 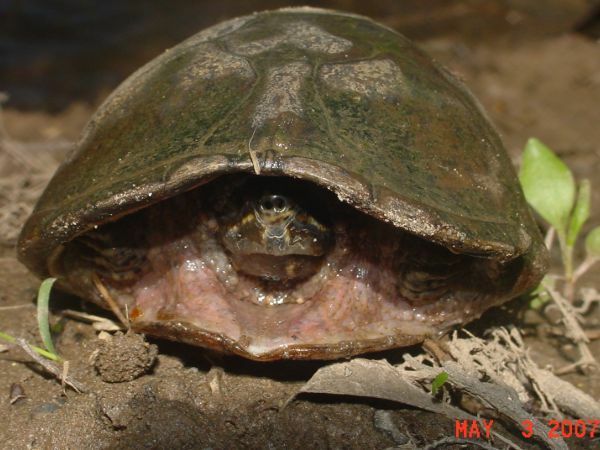 Moreover, the state of Iowa has also listed musk turtles as threatened species. 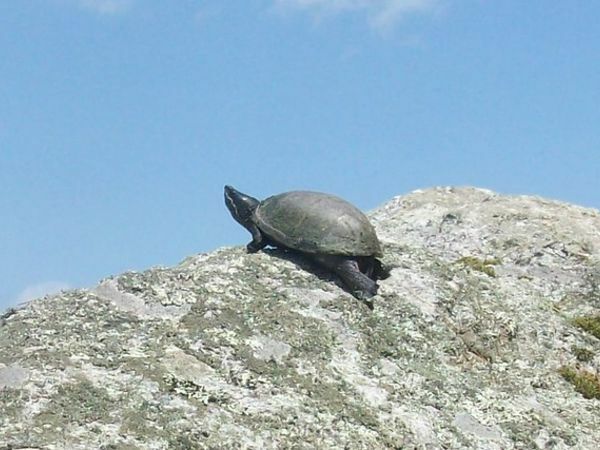 In ranges of Canada, wetlands that have less human populations harbor great amounts of musk turtles. 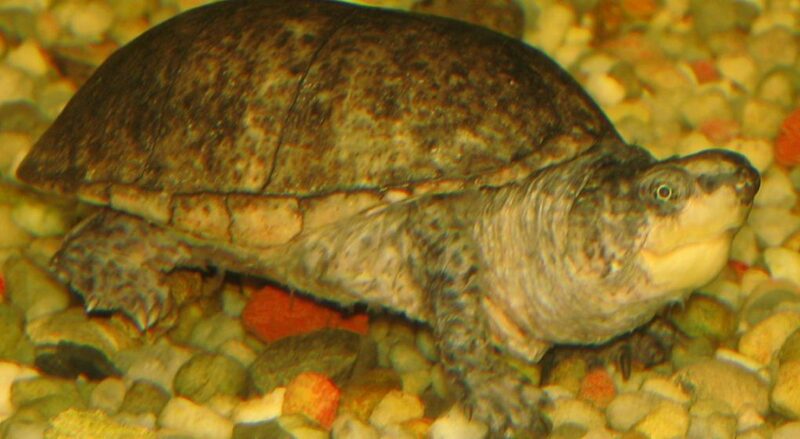 Common Musk Turtles also known as the Stinkpot or Eastern Musk Turtle ar often confused with the mud turtle. This video gives a great walkthrough of their characteristics and key differences between the two turtles. Common musk turtles are easily available and due to their size, normally petted. Their diet and habitat are not very demanding. Therefore, they can make good pets. With good care and proper setting, they can stay your pets for 20 to 30 years. Now, over to you! Do you have a common musk turtle as a pet, or are you considering one? Let me know in the comments below!